Bright!Tax is the leading tax services provider for US expats worldwide, having won an unprecedented 4 Global EMMA Awards in 2017. In partnership with Godiva Tax Services, Bright!Tax now offers Australian tax return filing as well, providing a time and hassle saving one stop shop tax filing solution for Americans living in Australia. Australia taxes residents on their worldwide income on a scale from 0% to 45%. The Australian tax year runs from July 1st to June 30th. Australian tax returns are due by October 31st. Bright!Tax, the leading US expat tax services provider, now offers Australian tax filing too, in partnership with Godiva Tax Services. 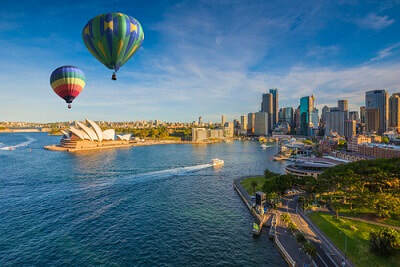 This is a fantastic opportunity for Americans living in Australia, as despite the two differing tax years and tax systems, our clients now only need provide their tax information once. They can then relax in the knowledge that we will file both their US and Australian returns accurately, on time, and in their best interests. If you are an American living in Australia and you would like us to file your Australian return for you, simply fill in the brief form below, and we’ll be in touch right away to let you know the next steps. If you would like us to file your US return first, or both, click the button at the foot of this page to get started. Thankfully, there a number of exemptions available for expats that, when claimed, mean most expats owe little or no US tax. They must still file a US return to claim these exemptions though. Some expats are subject to further US filing requirements too, such as FBAR (Foreign Bank Account Report) filing, which requires expats to report their foreign bank and investment accounts if the total combined balances exceed $10,000 at any time during the year. For expats who are behind with their US filing, there is an IRS amnesty program called the Streamlined Procedure that allows expats who are behind with their US tax filing catch up. Bright!Tax is the global leader in US expat tax services and an outstanding specialist in all US expat tax matters, including federal and state tax return filing, trusts, corporations, foreign asset and account reporting, and catching up using the Streamlined Procedure.